Ofsted inspectors have given a mixed report on standards in Kent schools, adding to the debate over selective secondary education. They say that it has more underperforming schools than other parts of England - with test results below average but GCSE results above average. Kent says the Ofsted report is just a "regurgitation" of earlier findings, some out of date. Pro-comprehensive campaigners say the report shows children's education is being damaged by selection. The government says it does not support selection at the age of 11 and does not wish to see it extended. The Education Secretary, Charles Clarke, met anti-selection campaigners from Kent before Christmas and suggested they focus on the issue of standards. He revealed to MPs last week that he had commissioned the Ofsted report, now published in the Commons library. He said he had been interested in evidence that grammar schools in Kent and Medway did less well than other grammar schools in the country. Also, that the last comparison made by his department between the results of grammar and comprehensive schools, in 1999, showed that 100% of pupils in the top 25% of comprehensive schools achieved five or more A* to C grades at GCSE, compared with 96.4% at grammar schools. "The fundamental point that I want to make ... is that the judgement must be based on educational standards for everybody, and it must be based on the facts and the factual assessment of those standards," he said. According to Ofsted, 88% of secondary age children go to comprehensives in England as a whole. The proportion in Kent, the largest LEA, is 30%. 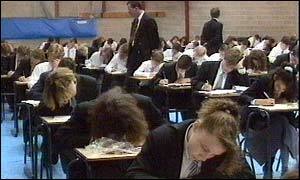 About a third of Kent secondaries are grammar schools, another third secondary moderns and the rest comprehensives. The watchdog compared Kent with its "statistical neighbours" - similar areas in Essex, West Sussex, Lancashire, Northamptonshire, Worcestershire, Bedfordshire, Gloucestershire and Nottinghamshire. It found that the percentages of seven and 11 year olds achieving the expected level were lower in Kent compared with those nationally and with their statistical neighbours. The percentage of 14 year olds achieving the expected level was almost in line with statistical neighbours and was better than the national average for English, mathematics and science. At GCSE, 54% of Kent pupils achieved five or more top grades last year, compared with 53% for statistical neighbours and just under 50% nationally. More Kent schools were failing to provide an adequate standard of education - requiring "special measures". The proportion of high-achieving schools is substantially greater than nationally, probably reflecting the high number of grammar schools in the county, Ofsted says. But the proportion of low-achieving schools is also substantially higher than nationally, "probably reflecting the high number of secondary modern schools in the county". Using the standard measure of social deprivation - children's eligibility for free school meals - Kent has far more low-achieving schools at all stages. But the inspectorate says it has had to compare Kent's secondary modern schools to national comprehensive schools, whereas "ideally, results should be compared to national secondary modern benchmarks". Kent County Council's cabinet member for education, Paul Carter, said some of the report was based on out-of-date figures. The report also showed Kent primary and secondary schools were "adding value" in educating seven to 11 year olds and 11 to 14 year olds, he said. "It's really much ado about nothing." But the Kent Stop The Eleven Plus campaign (Step) read things differently. Its chair, Rebecca Matthews, said: "Kent know the evidence. "They refuse to confront the truth of that evidence. They are still sticking their heads in the sand. "But hopefully Charles Clarke isn't." She hoped the days of children being "held hostage to political expediency" were nearing an end. "Things are looking up, as far as I'm concerned." She said Step had been asked by Mr Clarke to provide him with information on the way parental ballots operate. Anti-selection groups have long complained that the complex regulations are weighted against them. Only one ballot has ever been held - in Ripon, North Yorkshire, where the campaigners lost.